A NATURAL storyteller from a young age, Eva Warren’s writing journey began as a dream – like most authors – but in the end became a healing activity after losing her husband. 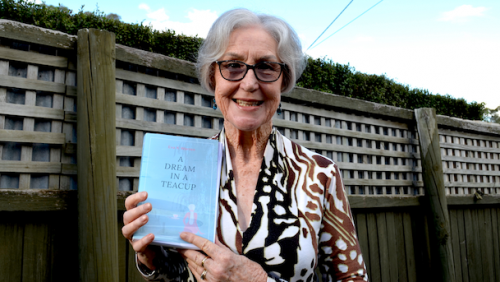 “I worked out a lot of my own stuff through the characters,” says Eva, 74, of Macquarie, who recently launched her novel “A Dream in a Teacup”. But the “dream” in the novel doesn’t refer to Eva’s passion for writing but rather illustrates the ideas of psychoanalyst Carl Jung. “From a Jungian perspective, ‘A Dream in a Teacup’ is a deeply personal story, which could easily be likened to me working through a dream, using the characters involved,” she says. Eva says the fictional novel enabled her to dig deep into her subconscious and served as a therapeutic tool in a time of grief. “My beloved husband of 51 years became ill and died during the last three years of its writing,” she says. “Being able to escape into my creative side and delve into my psyche has been nothing short of a warm and healing balm. Set in 1949 in a working-class Canberra, the novel is about Brigid who, in an effort to make some sense of her life, records and works through her dreams daily. It’s here that Brigid, a Catholic woman with a secret past, marries Dougal, a widower with four children, who also leads a double life. 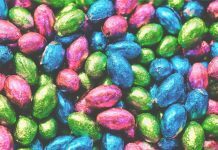 “Through her next-door neighbour, Brigid comes to hear about Carl Jung, and from what she could gather, Carl Jung and Hildegard von Bingen both become a catalyst in her redemption,” she says. Eva grew up in Westlake, which was then situated in Canberra’s embassy precinct – now known as Stirling Park. “Westlakes’ 62 unlined, weatherboard cottages were only meant to be temporary,” she says. They were set up to house the workers who came to build early Canberra and were demolished in the ‘60s. 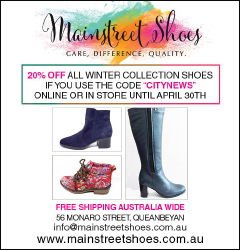 “It’s unique because Canberra’s seen as a political place but people don’t realise that real, ordinary people live here,” she says. Through her writing Eva got to know the characters intimately and says they became her friends. But there was a time when she once feared these characters would never come to life. “I always loved telling stories from when I was little and I had a great imagination,” she says. During Eva’s composition (writing) classes in primary school she says her work would always come back covered in red marks. “The nun would read out the best two but, of course, mine was never read out,” she says. Eva left school at 14 frustrated that her dreamt-up stories would probably never be written down. “In my late thirties I went to night school and studied English and creative writing in the hope that I’d eventually be able to make these stories come to life,” she says. It wasn’t until further down the track in her retirement, after a career in health, a masters in theology, ageing and spirituality, where Eva gained the courage and time to write. Then, after joining a writer’s group her writing was refined again and her confidence increased, leading her to start from scratch with more clarity. Ten years in the making and “A Dream in a Teacup” was launched on October 17. Previous articleOpinion / Why the ‘need’ to ban smoking in the prison?